Change Overload! - IRM Connects, by IRM UK | IT Blog. The purpose of this paper is to share ideas for how we identify and estimate how much change is happening in our organisations mitigate the risk that there is so much change that it risks destabilising the current operations. The ideas shared in this paper are the result of numerous workshops I have been involved in over the last year with diverse organisations representing the third sector, the private sector and the public sector in the UK, US and Middle East. Melanie Franklin, Co-Chair of the Change Management Institute UK. One thing all these workshops have in common is a realisation that there are no easy solutions. Organisations have far more ambition than they have resources, requiring decisions on what to prioritise and what to put on hold. I have also noticed that the debates in these workshops indicate a demand for a new type of change management, which I will refer to as enterprise level change management. It is no longer sufficient to have a lifecycle and a toolkit for managing individual changes. We need techniques for managing the collective effort of change and to understand how that collective effort impacts the strategic capability and achievements of our organisations. The volume of change continues to increase, as a result of external triggers and the internal pressure for continuous improvement. 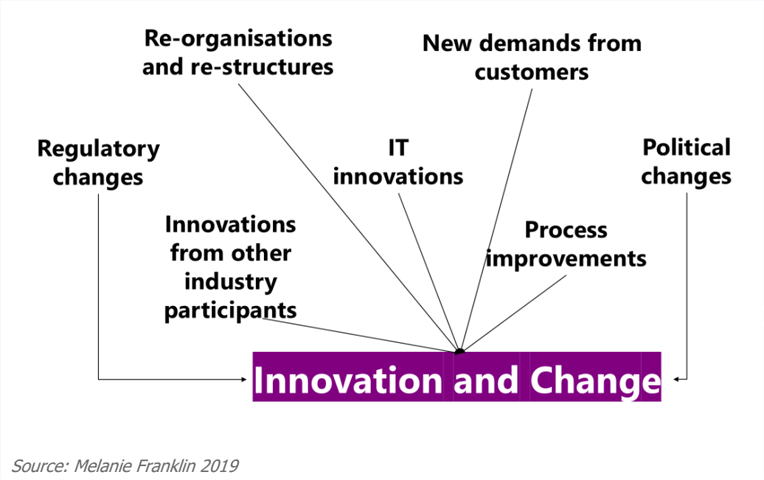 This has led to an increasingly important issue, which is how does an organisation find the optimum balance between “business as usual” and innovation? Too much change and there is not enough resource to spread between the two priorities. Too little change and the organisation risks falling behind as others in its industry continue to innovate and improve. • Staff feel they do not have the time to do things to the right standard before they have to move off and do something else. • There is pressure as staff try to address multiple issues at once, with the associated productivity dips as they try to remember where they had got to with a task since they last addressed it. • A feeling of never being finished, and the hopelessness that this can trigger as every day is a rush through a To Do List that never ends. Many organisations are struggling to address this dilemma, often because they are failing at the first step, which is to accurately identify and track what change is taking place and what is planned. Portfolio management is an essential element of a change management capability, because it enables business leaders to consider what else is happening, before taking a decision to commission another idea. This is the beginning of an enterprise-wide approach to managing change. How can the decision to trigger a new change idea be the right one if the current situation, considering all changes that have most recently changed business as usual, plus those currently underway and others that are already planned have not been understood? How does a senior leader take an informed decision about the overlaps, inter-dependencies and duplication in scope without this information? 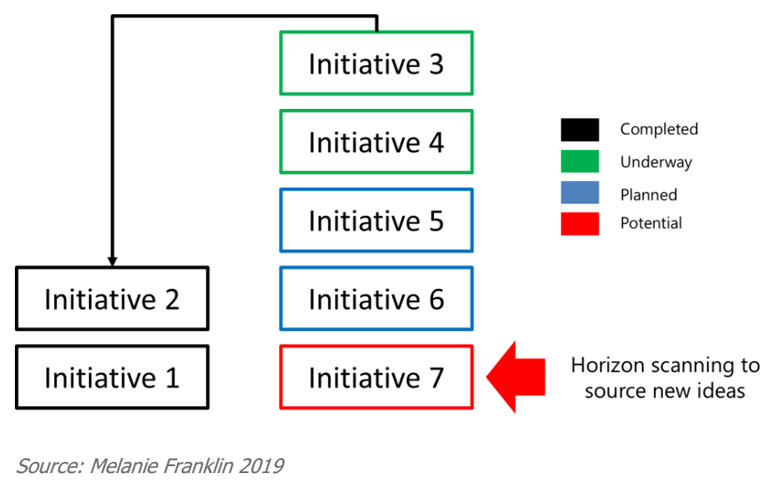 Even if an organisation has established a portfolio of initiatives and is actively evaluating their move through the lifecycle from initial idea, to authorising the work to plan them and then authorising their implementation, there are still problems. More than 90% of the organisations that I talk to do not capture any metrics outside of project metrics. They capture data on delivery of the project deliverables, but do not track the impact of incorporating these deliverables into current ways of working. Nor do they calculate the required effort and time to make these changes and train staff in these new ways of working. The result is often a “naïve” portfolio which underestimates the true time and cost required to realise the benefits from each of the initiatives. As a result of the problems outlined above, I think there is a vicious circle, where the difficulties of understanding how much change is taking place, how it might impact staff and their capacity to deliver business as usual and how to get the information we need to take the right decisions all feed each other. Assessing the impact of change on a business unit is a subjective exercise. The same change can be viewed by different individuals as significant upheaval, requiring effort and time to address, whereas a colleague feels that they are not disrupted, and that the change just adds an extra task to what they already do. 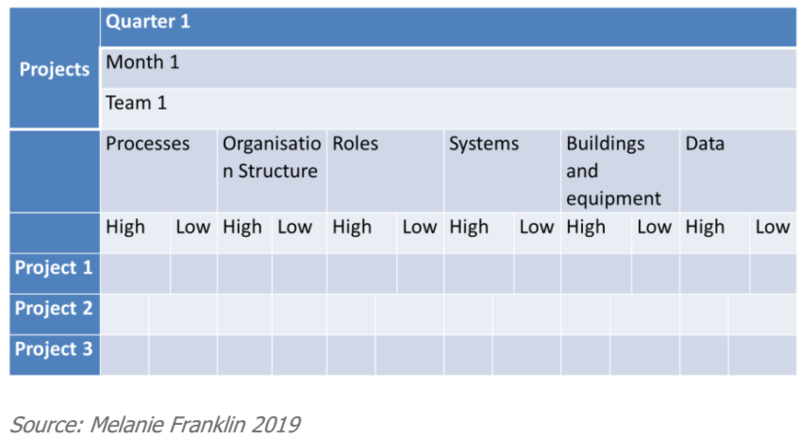 I think we need to agree a composite measure of impact that summarises the likely effect on processes, systems, the way work is allocated to team members, and any changes to timing of work, equipment used, required inputs or format of outputs. We could try to collect this information for each of these factors, but I worry that it makes the job too labour intensive. 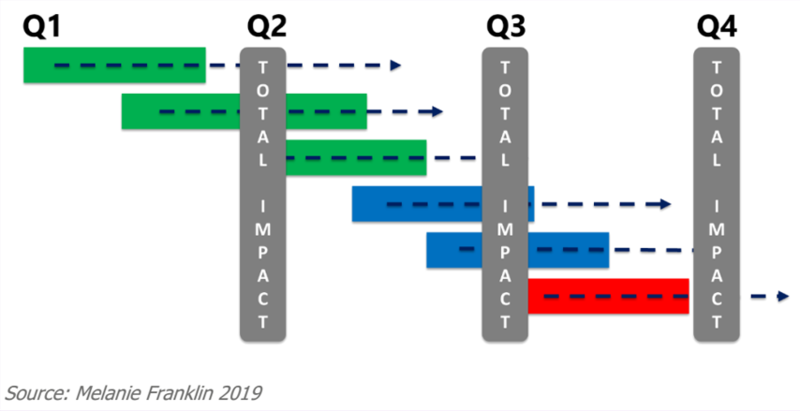 This Impact Assessment template looks daunting to complete, as it asks a lot of specific questions for each team to complete. I think there is a lot more work to do to agree what makes something a sizeable impact but a friend of mine put forward an interesting idea, that those of in change management should work with our colleagues in psychology. After all, there are established measures for what makes something stressful e.g. moving to a new house, death of a parent, loss of a job etc. Again, these are subjective, with the impact differing from person to person but I think we could come up with a league table of highly impactful to less impactful changes to help size the overall impact on a business unit. I think we could also benefit from adopting one of the techniques from Agile. In the Scaled Agile Framework (SAFe®) there is an event called a Planning Increment that brings together all the project teams to collaboratively plan the next few months work. 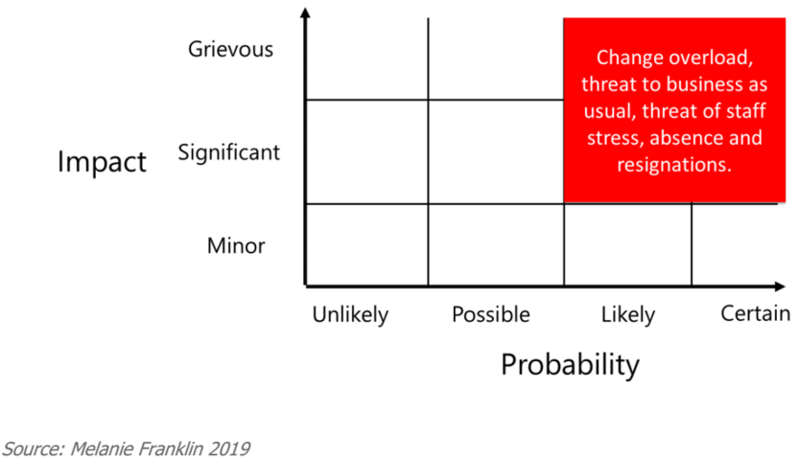 We could ask PMOs to facilitate something similar to review and understand the impact expected from all the initiatives currently in the portfolio, every few months, to get an early warning of change overload. To generate the support for collecting impact data, we should show how integral it is to create a fully costed Business Case. Too often the Business Case only includes costs for the delivery part of change and doesn’t look at the costs of adopting these project deliverables. This doesn’t make sense to me, because the Benefits that are claimed in the Business Case will only be realised if new ways of working become the new “business as usual”. o Cost of running old and new systems and processes in parallel until the new ways of working are at an acceptable pace and level of accuracy. • Risk of destabilising business as usual, where level of customer service and staff engagement fall below acceptable levels. 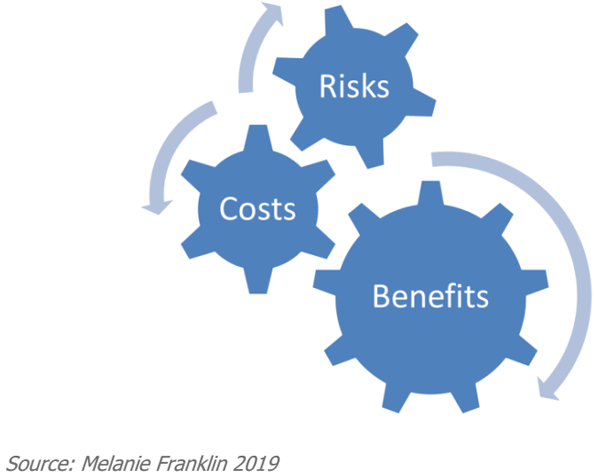 The impact of change can give greater clarity on how benefits will be realised as managing the impact of the change leads to the adoption of the change which is when benefits are realised. Without senior level commitment, the effort required to collect and collate the expected impact of changes will not be authorised. 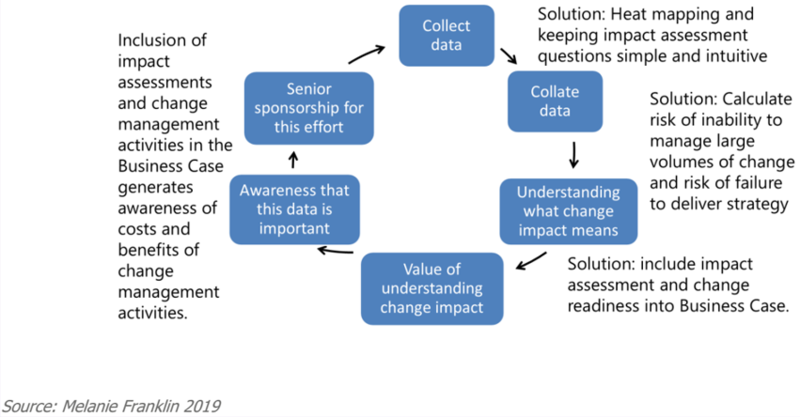 In the vicious circle diagram earlier in this paper, it is clear that if senior leaders are not asking for the data, then the data is not collected, but they only ask for it when they see the value of it, and they only see the value of it when they receive it. It is a classic Catch-22 and we can only break the deadlock by better explaining the value of change management. We need to be clear about what we mean by the impact of change, clarifying the difference between creating a change using project management and involving the business in creating new ways of working. This ‘transition’ from current ways of working to new practices often takes longer and involves many more people than the creation of project deliverables. The community involved in transition is everyone who needs to change how they work, not simply a small project team. 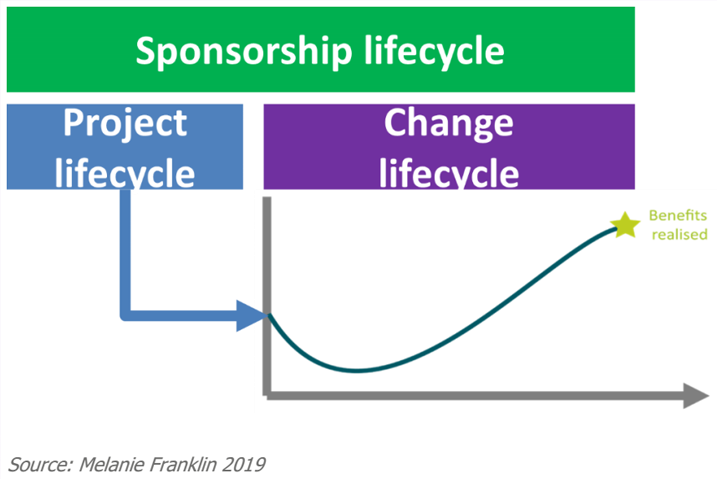 Of course, if a Sponsor doesn’t realise that change is this two-step process of Delivery and Adoption then they will not be interested in tracking the impact of the move from current to new ways of working. So as a first step, we need to clarify the full scope of the Sponsor role with senior leaders. Another approach is to describe change overload in terms relevant to executives. Often in managing change, I find myself explaining the importance of getting the buy-in and support of those impacted by change, and how I need their participation in creating new ways of working. I can feel senior leaders getting bored, because what I am saying sounds to them like a delay to the achievement of their desired outcome. I am far more effective in getting their support if I talk in their language, which is the language of risk and returns. Tracking the total level of impact of change on the current business environment is a risk management activity. It minimises the risk that the organisation cannot manage the current volume of change. This in turn manages the risk that staff do not have the energy and focus needed to land the really important initiatives because their efforts are being spread across a broad range of initiatives. I think the difficulty for change professionals is that we cannot tackle the problem of change overload in isolation. 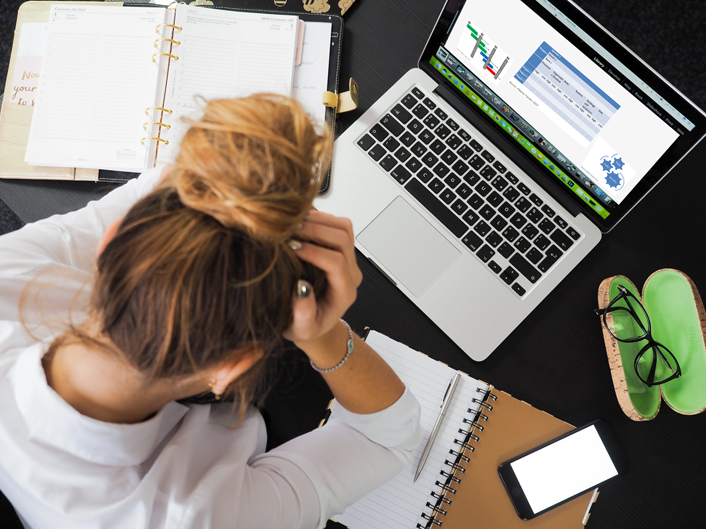 Impact assessments stray into the area of business metrics, and demand input from all those in the business units who already frantically busy doing the day job. Unless we can get appreciation of the importance of the questions we are asking and can demonstrate how the information we collect will be used to improve decisions on which initiatives are implemented, we will not get the business involvement we need. I think this is why at the most recent workshop I attended on this subject, so many of my fellow change professionals felt the need to take a step back and work on gaining senior level understanding and commitment to the value and benefits of change management. 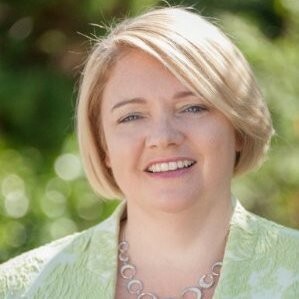 Melanie provides c-suite advisory services, specialising in cultural change, with specific emphasis on building the internal capability of organisations to plan and lead change initiatives. She works for a number of high profile organisations including the United Nations, the Houses of Parliament, Zain Communications and National Grid US. She is the Co-Chair of the Change Management Institute UK and is a respected author of text books and articles on change, project and programme management.